Burning Man takes place in a remote desert in the upper Northwest corner of Nevada. Sitting three hours away from the nearest city. How does one get to such a remote location? The organizers have considered this conundrum and have created a plethora of resources for the perennial citizens of Black Rock City. With a mind for being eco-friendly, the organizers have introduced a bus to carry participants to Burning Man from San Francisco and Reno. Known as the Burner Express, this handy service caters to the large population of Bay Area burners, and any international participants flying into the Reno, NV airport. Don’t worry about having your luggage capacity restricted, there is enough space on the buses for two pieces of luggage and a carry on. If you are a smart packer, then this is more space than you need. Bus riders also get the opportunity of spending hours, before the official event begins, meeting several of their burner compatriots. Not to mention that the bus gets to by-pass the line at the entrance gate, getting you and your luggage out of traffic quicker. You can find tickets for the Burner Express Bus on the Burning Man website. Now you may think flying to Burning Man just means flying into Reno or San Francisco, and then catching a bus from one of those two cities. This is indeed an option, but (believe it or not) there is also a small charter that flies directly into Black Rock City. The organizers are not kidding when they call it a city. There are bigger towns that don’t have their own personal charter. 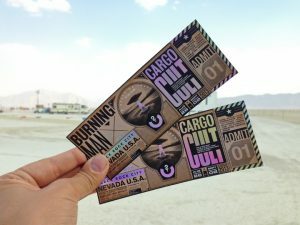 To learn more about the charter or to make a reservation you can visit the site linked to from the Burning Man transportation page. It will be a road trip getting to Black Rock City wherever you come from, but that’s the best part. Driving through Nevada is a true out-west road trip experience. The roads are long and straight, surrounded by mountains and vast uninhabited deserts. You know that saying “it’s not about the destination, but the journey”? They were talking about taking a road trip to Burning Man. (Albeit, Burning Man is about as epic a destination that you could have.) Still, the road, a car, and a few good friends (or random strangers) is about as good as it gets. What strangers? Why, the strangers you’ll be meeting while saving some fossil fuel with the ride share program. Now’s the time to buy airplane and bus tickets, so start making those plans as to how you’re getting to Burning Man in 2017.